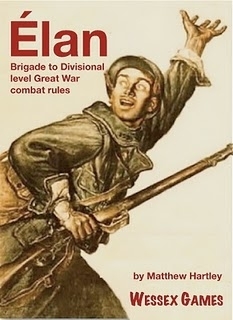 Élan is a set of Brigade to Divisional level scenario driven rules for the European theatre during The Great War. Designed as a two-player game using 6mm figures, with little adjustment it can be played solo, or in any scale from 2mm to 20mm. The basic mechanism used in this game - élan, distils a number of factors - morale, training, leadership, fatigue, "friction" - into a single numerical value. Whenever a unit tries to perform an action, its score is rolled against. Failure not only results in the attempted action failing but a fall in the élan score, as the unit begins to succumb to the stresses of the battlefield. Under this system, even the most motivated troops will eventually be worn down and break. In the game, much of the minutiae of combat has been ignored. As Divisional or Brigade commanders, the players only see the results of actions, not the process on the ground by which those results are determined. A commander will know only that a unit has not advanced, not which one of the multitude of reasons why it hasn't. This absence of precise control at the company level, is mirrored further up the command structure by using a non-sequential turn sequence to simulate communications failures (and initiative) within the command system. Élan contains army lists for 22 nations involved in the Great War and instructions on how to convert any MicroMark army list for play in the game. Price: £3.00. Pages: 15 A4 including cover. To buy Élan go here. New York 1834 - join the Bowery Boys as they attempt to smash their way past the Dead Rabbits . Chicago 1897 - meet the Irishers and Bohemians, two gangs of school kids who fought a lethal twenty-five year long gang war. 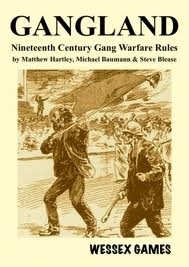 New York 1857 - the most bizarre gang war of all with two New York police forces fighting each other and attempting to free each others prisoners. San Francisco 1875 - defend the honour of the Suey Sing Tong against the insults of the Kwong Dock Tong. London 1887 - strike a blow for social freedom against the repression of the British government by marching on Trafalgar Square. Bristol 1831 - join Special Constable Isambard Kingdom Brunel and resist the Reform Bill rioters attempts to storm the Guildhouse. Glasgow 1924 - crash the Palour Boys dance hall with the Bedford & Bridgegate Boys and try and kill Razzle-Dazzle. Price: £5.00. Pages: 19 A4 including cover. To buy Gangland go here. 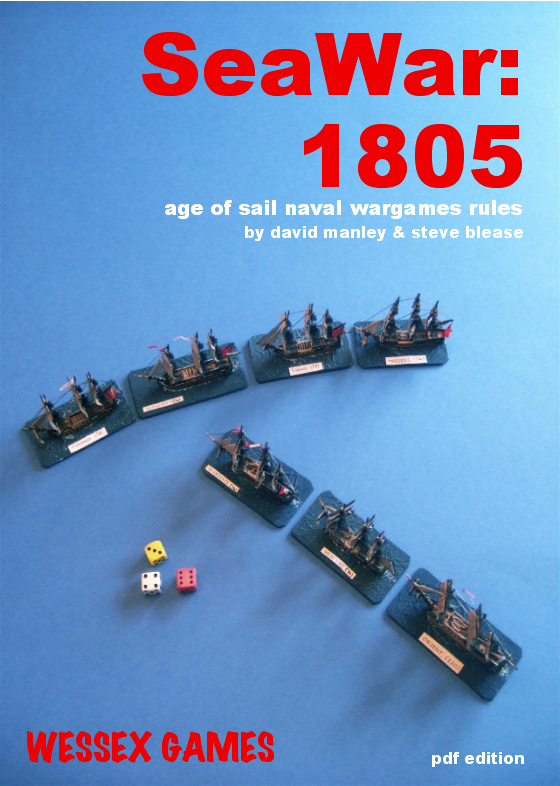 SeaWar: 1805 is a set of ‘age of sail’ naval wargames rules designed for beginners, but challenging enough to give experienced ‘sea dogs’ many hours of enjoyable gaming and also provide the ideal vehicle to introduce their ‘land lubber’ friends to the joys of naval wargaming. So if you have been inspired by the real life characters such as Nelson and John Paul Jones, or fictional heroes such as Hornblower or Aubrey, SeaWar: 1805 is your ideal starting point into recreating their battles in 1/1200th scale on the tabletop. SeaWar: 1805 includes: comprehensive rules for naval battles for the Age of Sail period (1652 to 1829) also covering weather, fortifications and fire ships; additional rules for games that include galleys, gallasses, ironclads and steam ships and a list of wars with notable naval activity during the Age of Sail period from the First Anglo-Dutch War to the Greek War of Independence. Price: £5.00. Pages: 18 A4 including cover. To buy SeaWar: 1805 go here.